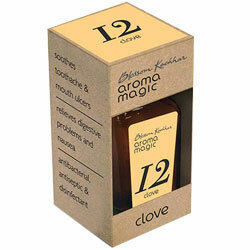 Aromamagic Clove Oil Soothes Tooth Ache & Mouth ulcers. Relieves Digestive Problems & Nausea. Relieves Digestive Problems and Nausea. Soothes Tooth Ache and Mouth ulcers. Anti Bacterial, Anti Septic and Disinfectant.